Alstroemerias – known as the Peruvian Lilu or Lily of the Incas, they have striped petals and no fragrance. They come in vibrant colours like orange, pink, rose, purple, red, yellow or white and will last about two weeks in a vase. Hyacinth – have an intoxicating scent and feature clusters of small flowers along a single stalk. 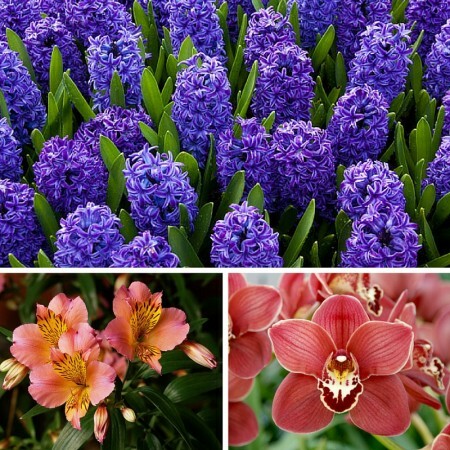 Hyacinths come in many rich colours like magenta and deep indigo, as well as pale pink, baby blue, yellow and white. Cymbidium Orchid – or the Boat Orchid is a stunning long-lasting flower that comes in flamboyant colours including orange, apricots, browns, reds, burgundy, yellow and green.